No bar is furnished without an appropriate arrangement of barstools. Leather barstools are sturdy, exquisite, rich and tasteful. Lakeland furniture will help you investigate a wide range of them and help you pick leather and faux leather bar stools to match your interior. Faux leather bar stools have many favourable conditions over genuine leather. The leather is extremely permeable and spongy, so drops of fluid will rapidly douse into the thing if not cleaned immediately. In the event that the leather is not safeguarded, this can cause a stain. This is also not ideal when individuals will eat and drinking while at the same time sitting on the bar stools. Choosing which texture to use for your personalized seating can be a truly difficult decision, particularly since there's such a wide range to look over. The choice between genuine leather or faux leather is most likely the hardest to make, that is the reason Lakeland furniture have made this blog entry to help you understand the upsides and downsides of each and to ideally settle on your choice. To begin with, how about we have a peek at genuine leather, nobody can damage its reminiscent odour, touch, and luxurious appearance. Much the same as the skin it has pores, permitting it to inhale and change temperature with your body. Perfect for the individuals who endure with hypersensitivities or asthma, it doesn't hold clean like the texture and is extremely attractive to the bugs. Known for its solidness it's probably not going to peel or break, while any well-used spots on the seat build up a polished sheen that exclusively makes it milder and more appealing with age. The leather is additionally one of the main fabric alternatives that really looks better with age! It's hard wearing, which means you can be comforted with it and it will last longer also. While lovely coverings accompany an expensive price, they are likewise exceptionally differing sizes as a customized and general size, which means there is a high rate of waste with lots of abundance texture not being utilized. This is particularly effective on stable seating where vast boards might be required and creases should be maintained a planned distance from. The leather is likewise high maintenance, with a consistent waxing procedure expected to guarantee it remains looking awesome. In conclusion, you will find that leather tends to prolong its life with usage, so dependably consider whether wrinkles have been suited for your future settings. On the flip side of the coin is faux leather which is the minimal effort as correct approximations can be requested, which means less wastage. It is additionally low upkeep with no consistent care required and is ideal for busy sections with wipe off and waterproof choices accessible. And additionally being hard draining and tough, it likewise won't torn apart or blur like genuine leather. As faux leather is a man-made material, it implies you won't be confined with regards to the decision of shading, it can even be given a leather-look appearance! You may miss the touch and smell related with genuine leather. Both choices have positives and negatives, the most imperative thing is to consider items of common sense when settling on your choice. The measure of activity and general usage are particularly critical but which ever you choose from leather or faux leather you need to take care of your basic theme of the interior. A few people lean toward faux leather just on the grounds that no creatures are hurt really taking shape of the material. Faux leather is produced using a machine, which guarantees that the texture has an even, steady shading all through. It can likewise be coloured into a wide range of shades and is typically blur safe. When looking for faux leather bar stools, you will find there are such a large number of alternatives in shape and style. Faux leather bar stools are an extraordinary decision for a kitchen, high dinner table, in an entertainment room, or even at a heightened work area or work space. Bar stools are to a great degree flexible, and everybody can discover an application for them! 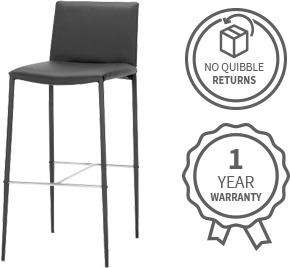 For a definitive in customization, consider a bar stool that swivels and has movable height. This implies you won't need to stress over perseveringly measuring your table and stools before you get them – bring them home and conform the height likewise! Whatever you choose for your home a genuine leather or faux leather bar stools, Lakeland furniture is offering both kinds of bar stools with affordable prices and outstanding designs.